Supreme Court Justice Sonia Sotomayor and award-winning artist Rafael Lopez create a kind and caring book about the differences that make each of us unique. Feeling different, especially as a kid, can be tough. But in the same way that different types of plants and flowers make a garden more beautiful and enjoyable, different types of people make our world more vibrant and wonderful. In Just Ask, United States Supreme Court Justice Sonia Sotomayor celebrates the different abilities kids (and people of all ages) have. Using her own experience as a child who was diagnosed with diabetes, Justice Sotomayor writes about children with all sorts of challenges--and looks at the special powers those kids have as well. 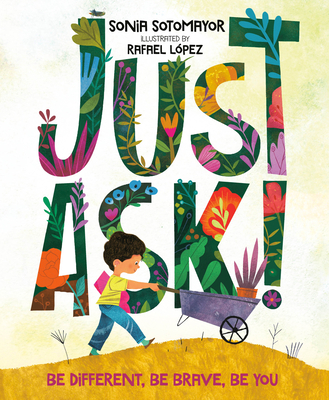 As the kids work together to build a community garden, asking questions of each other along the way, this book encourages readers to do the same: When we come across someone who is different from us but we're not sure why, all we have to do is Just Ask. Sonia Sotomayor was born in the Bronx, New York. She earned a BA from Princeton University and a JD from Yale Law School. She served as Assistant District Attorney in New York County, and then as a litigator at Pavia & Harcourt. In 1991, President George H. W. Bush nominated her to the US District Court, Southern District of New York. In 1997, President William Jefferson Clinton nominated her to the US Court of Appeals for the Second Circuit. President Barack Obama nominated her as an Associate Justice of the Supreme Court on May 26, 2009, and she assumed this role August 8, 2009, becoming the first Latina to ever hold such a high position. She is the author of Turning Pages, My Beloved World, and The Beloved World of Sonia Sotomayor. Rafael López (rafaellopez.com) won Pura Belpré medals for Drum Dream Girl and Book Fiesta, and has also received three Pura Belpré honors, two Américas Book Awards, and the 2017 Tomás Rivera Children's Book Award and Society of Illustrators Original Art Silver Medal. His work has been featured in Communication Arts, American Illustration Annual, Graphic Design USA, and Huffington Post. He's a founder of San Diego's Urban Art Trail movement, created seven US Postal Stamps, and created official posters for the '08 and '12 Obama-Biden campaigns. Follow him on Twitter @RafaelLopezArt.